There is that wonderful time as we come to a new year that we are filled with hope for the future. This year is going to be better and we are going to make some great new plans and fulfil them. As humans we seem to like to create boxes and as we get to the end of one we can pack some things away and start a new one. There is no reason that we can’t do this on any day of the week. But we do like to think we can start something new on a new year, a new month or a new week. I am as guilty of this as anyone else. I’ve been holding off doing something that I know I should have done months ago and will kick myself for not doing when I get round to it. But like everyone else I have been waiting for the new year to start afresh. That moment in time that says, this is a clean slate and anything can happen that we chose to happen. I have already started to make some changes in my life and the last few weeks have been no exception. In order to grow we need to take ourselves out of our comfort zones and do something new. If we want change we have to facilitate that ourselves. I have often used the image with my clients that, if we always go to the Tower of London, we will never see Buckingham Palace let alone Windsor Castle. By going somewhere we have never been before we start to change hopefully towards who, or where we want to be. 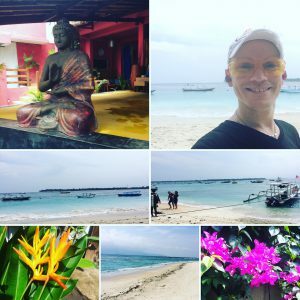 For the last couple of weeks I have been backpacking round Indonesia and Malaysia, I have spent more money than I budgeted for, but as quiet often happen the best made plans didn’t quite happen. I had to come up with a plan B, which actually turned out to be quiet awesome. The first thing I am asked is who are you going with or are you here with? The truth is I am travelling around this part of Asia on my own. That was part of how I wanted to grow, to be self reliant and to have to make decisions on my own (but if you need a little help or to know you have made the right decision, just ask Facebook your friends will be happy to tell you). Many people have told me that I am brave to be doing this. Personally I just see it that I am growing to become a more self sufficient and confident person. I’m sure that what ever it is you are thinking of trying it’s as much out of your comfort zone right now as travelling around this part of the world is for me. I didn’t just jump on a flight last minute this was all in bite size chunks and each bit took me a little further out of my comfort zone. Let’s just say that your new year new you is to get a bit fitter and healthier. This is something that we can all relate to at new year and many of us try this one. I’m hoping I can help you to make your goal a success with this article. Hopefully each step can relate even if your goal is something different. I booked my flight back in April (it’s now the end of December). Majorly for the reason that my sister and now fiancé had just come back and it sounded amazing. I was jealous! I wanted that experience too. If I booked that far in advance the tickets were reasonable. I had nearly 8 months to figure out what I was going to do. This can be called contemplation, it is probably what you have been doing up until now. Thinking about how you are going to change your life what this big end goal could be. Mine was to go to Bali and the flight was booked. As the date I was leaving grew closer I was talking to my sister and her fiancé about what they did knowing that I was going to do something similar and use their experience to help me. You may have been doing this talking to friends who may have had the journey that you want to take and you are thinking about the best possible way to make this happen. Just before I left the UK for Indonesia I decided to play it safe. 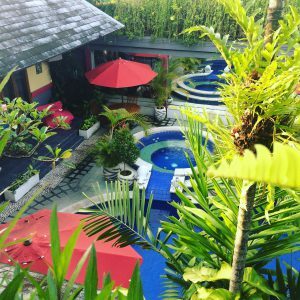 I booked a hotel that would pick me up from the airport and take me direct to the hotel in a private transfer and I’d stay there for three days whilst I acclimatised and figured out how to do what I had roughly planned. This can be the most important part of a new you. Taking a step that although is outside of what you normally do, it’s still with in your safe zone. A baby step. We can achieve success by not running before we can walk. Although the goal might be a marathon the first step is important, and it’s so important that it is achievable. If you are looking to get fitter you may try a class with a friend. They can be your security blanket or a hand to hold. Take your time and do what feels right for you. Don’t try to keep up with everyone else just do what you are capable of. Believe me every instructor wants that new person to have a great time and to come back again. We hope that we can create an atmosphere that you feel safe in and that you have time of your life. We thrive on knowing you have had a great time, and we want to support you for the hour you come to see us on your own personal journey. After my three days were up it was time to move on. 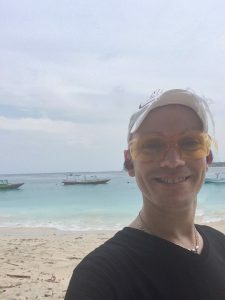 I had booked a fast boat to the Gili islands and a hotel there where I was hoping to get a boat trip that would Island hop down to Komodo to see the dragons (one of my bucket list to tick off) again quiet a safe Thing to do. I would met the transfer in the square that would take me to the boat which would take me to the islands, a few nights in a hotel there then off on a four day boat trip. Halfway through the transfer there was a call saying that the fast boat had been cancelled do to big waves and I could either go back or take the ferry. To cut a story down to size the first two ferries were full, so by the time I finally got on the third which should have been two hours turned in to six due to the bad weather (it was quite a ride and not everyone felt very well, some people turned quite green). The next two hour boat ride turned into an hour and a half coach trip followed by a speed boat on to the island and then a horse and cart ride to the hotel. The point here is even the best made plans go awry but that doesn’t mean we can’t get there. Sometime it just takes a bit longer than we thought and it may be a little bit uncomfortable. As humans we are quite impatient. if you are on a fitness journey you will undoubtedly feel DOMS at some point along the way probably between 24-48 hours after your first session (what’s DOMS? Delayed Onset of Muscle Soreness, you are going to ache like you never have before) but once you have got passed this you have achieved a new level of fitness. You have made a giant leap. I could have stopped after my six hour washing machine of a ferry ride but I didn’t I kept going and the following morning I woke up to white sandy beaches and turquoise seas of what can look like paradise. The Gili islands. Don’t stop just because there was a little set back keep going. Things worth doing are never easy but the struggle is what makes them worth while! So you make it through your first session you ached for a few days. Your not going to let that stop you you are determined now. You phone the gym or centre or person doing the community class to book another class only to find out they are fully booked. Your safe class isn’t available. What do you do? I’ll tell you what you do, you ask what is available and you try something else. I went to book my trip to Komodo only to find out that the harbour master had cancelled all of the trip boats out of the harbour due to the wave size. It was too dangerous. Months of excitement blown away. I asked when the next one might happen and was told maybe in two weeks. I would be back in the UK in two weeks. Time for Plan B. I hadn’t even contemplated Plan B! Looking at all the tour guides there were hiking packages which could be cancelled due to the rain which might make the trails dangerous. (I didn’t fancy walking anyway, not just up a mountain or a volcano). Then one picture caught my eye. It was an orang-utan. The island of Borneo was north of here and part of it is part of Indonesia. So I asked and they guy said it was a short flight but wasn’t really that good of a sales man to see what I was asking for, he could have sold me a package and I probably would have taken it. So I did a bit of research and found a whole different story. If your class is cancelled or something gets in the way that’s ok. Try something new! Remember it can’t be any worse than the class you tried for the first time. It might just take you down a different route towards your goal but you never know who you might meet or what exciting things you fall in love with when you have tried. You already tried one new thing, that was the hard bit every new class from now on is going to be as achievable as that first class or maybe easier as you have gained new fitness. You might just find new friends and a class that you love. My research taught me that there were two species of Orang-Utan. The Bornean and a smaller species that were critically endangered. The Sumatran Orang-Utan. Both species are endangered but I have always wanted to go to Sumatra, and I flew over it on the way to Bali and could see the Rainforrest from the plane. If you are going to spend your tourist money it needs to go where it’s needed. I decided that if I spent money seeing the highly endangered Sumatran Orang-Utans which there are less than 7000 left in the wild maybe, just maybe my money would help local people to help protect them. My dad has had a phrase when we are on holiday as kids for special things. I gave the cat that goldfish and decided this was a once in a life time opportunity to see what may not be around in as little as a decade! My research said that I couldn’t get a direct flight I had to go via somewhere. 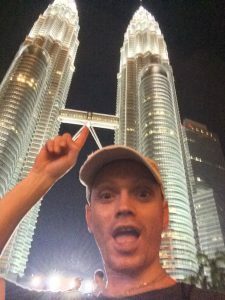 I went via Kuala Lumpur opting to spend a night there to see the Petronius towers (another thing on my list to see). I arrived on Christmas Eve and stayed in the most basic room I have ever seen literally two low beds and a desk with a TV, a pillow and blanket on each bed and a shared bathroom at the end of the hall, the toilet paper was on the desk (woo hoo you got your own roll). Due to the wonders of modern technology I got a message via Facebook that an old boss and her husband was staying in KL on their way to New Zealand and we met up for a couple of beers on Christmas Day. A friendly face in a far off land. And what a coincidence. Maybe that different class or new road will take you to see exciting sights and to meet friends you have seen for years. Even if you haven’t seen people for a while it’s amazing the positive impact that they can have on you just when you need it. Maybe that Zumba class was full and you tried spin. It’s a tough time but a smile from a buddy can help you get through or as I have seen people do in spin classes lean across and say ” just pretend to turn the resistance up”. Eventually I made it over to Sumatra. 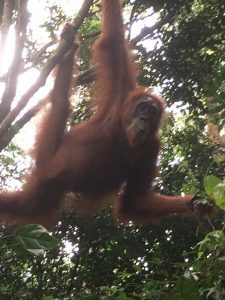 I picked a hotel that could organise tours and went all the way to Bukit Lawang and to the national park to the Rainforrest and amazingly I saw 6 Orang-Utans 3 mummy’s and 3 babies. I was lucky enough that one of the mums came down to see me and was just about a meter away from me where she quite literally posed for pics, and another one seemed to take great pleasure out of pulling faces at us so that we tried to pull them back. My guide was a master of what he did. 27 years of experience had me seeing them within 30 mins of getting out of my car (should you decide to go I have his email and number I highly recommend you tour with him, those great apes know him and almost talk to him). My aim had been to come to Indonesia and see a great endangered animal that was only found here. I may not have seen the one I wanted to but I still achieved my goal. I didn’t have the journey my sister and her fiancé had, I had my own with its own highs and lows. So as I sit here trying one more thing new (a deep fried banana with ice cream, the Mongolian beef sounded a little too hot and scary for me) I guess what this article has been about is don’t be afraid to try the new you this new year! But be aware it might not go quite as planned but the end result could could be even more amazing than you could have anticipated in the first place. Take the first little step, be safe and see where goes it may take you on an even better adventure than you ever thought. So what is the new year new you?